Wrestling is an extremely physically demanding sport where the body takes huge impact blows, and most limbs and joints are put under some pressure. If you're afraid of getting injured, then wrestling isn't the sport for you. Anyone who takes part in the sport will get injured at some point. I can hear you thinking to yourself-" But I watch the WWF and they throw each other around like rag-dolls and never seem to get injured!" The fact is the wrestlers you see on TV are professionals and have spent years learning the correct wrestling holds and the correct way to fall without hurting themselves. Even then they still get injured,hand and finger injuries like dislocations and fractures, knee injuries and shoulder injuries are the most common. 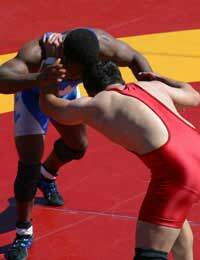 If you want to take up wrestling you should concentrate on building up dynamic strength in your knees and shoulders. These two areas account for more than half of all injuries that take place in wrestling training or matches. Great flexibility is also needed if you want to participate in the sport, especially in the shoulders. So what are the most common types of injury? The knee injuries that occur most often are ligament strains, Meniscal tears and Pre-patella Busitis. Ligament Sprains - A first degree sprain isn't too serious and a wrestler can return to competition when the pain is manageable enough to allow it. Second and third degree sprains must be given longer to heal and support or protection may need to be worn for a time after returning to training. First degree sprains are minute tears within the ligaments. Second degree sprains are where the ligament is partially torn and third degree sprains occur when the ligament is completely torn. Most ligament injuries outside the knee heal with rest, but injuries to the anterior or posterior cruciate ligaments will require surgery. Meniscal Tears - Are tears to the cartilage disc within the knee. Wrestlers suffer this type of injury quite often and an odd feature of this type of injury in wrestlers is the fact it is normally done without any real traumatic incident taking place. It occurs when a seemingly trivial manoeuvre like a quick turn or a stamping movement takes place. If a cartilage injury takes place the knee will swell or may lock or give way unexpectedly. Arthroscopic treatment will usually be needed to repair the damage. This treatment involves a small fibre-optic telescope (arthroscope) being inserted into a joint. Fluid is then injected into the joint so damage can be assessed and then normally the loose or damaged piece of cartilage is removed. The wrestler can usually return to training between one to three weeks after the operation taking place. Pre-patella Bursitis - You will probably have heard of this injury before, but you will know it as "Housemaids knee" Tradesmen like carpet fitters normally suffer from it. It's inflammation of protective sacs of fluid around the knee caused by your knees being constantly in contact with the floor. Symptoms are pain and swelling in front of the knee cap. Anti inflammatory drugs are usually prescribed to reduce the inflammation although in more serious cases a cortisone injection into the knee and a compression bandage may be applied. If this treatment does not work then a minor operation to remove the damaged sac (bursa) may be needed. All wrestlers suffer from this at some time in varying degrees. Normally if it's not too serious they will protect the area with a compression bandage or support. When training or competing they will wear a padded knee support. The main shoulder injuries are sprains or the joint becoming unstable through impact injury. Repetitive impact to the shoulder may see the joint trying to slip out, or dislocate completely. Rest for three to six weeks normally cures the problem, but if the shoulder continues to dislocate often then corrective surgery will probably be required. At a non professional level of wrestling protective headgear must be worn. This gives protection against abrasions, cuts and impact blows to the head which might lead to concussion. Cauliflower ear is common due to constant rubbing and contact with the opponents head while competing. Neck injuries aren't that common, and when they do occur they are normally strains.The lack of injuries in this area is mainly down to the wrestlers knowing how to protect the neck by falling and landing correctly.